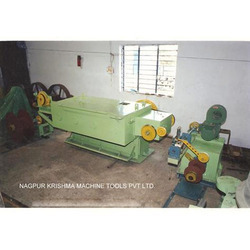 Prominent & Leading Manufacturer from Nagpur, we offer rod breakdown machine, bullblock wire drawing machine, step cone type wire drawing machine, medium wire drawing machines, fine wire drawing machine and wet wire drawing machine. 'NKMT' offers wide range of Rod Breakdown Machines which are precisely designed and manufactured using quality raw materials in accordance with industrial quality standards. Rod Break Down Machines are wet slip, stepped / single capstan type & are suitable for drawing large Copper / Aluminium round wires using numbers of dies in tandem.The RBD machines have horizontally mounted single / stepped Capstans which are hardened and ground finish. The drive to individual capstan is provided through Helical Gears. The gear train is housed in thick steel fabricated solid body and is oil immersed for smooth running. The die holders are adjustable and are provided between each capstant unit and the Dies are cooled by Jet Circulation System. Spooler : Single ended Arbor type. Range - Inlet- 8/12/16mm Cu & 9.5mm Al. Outlet- 3.15/2.65mm Cu /Al. MODEL - NKMT/ DOUBLE DIE-24” & 30” Drum Dia. NKMT/ TRIPLE DIE -26” Drum Dia For Aluminium Wire. Reduction % : 18%-20% in double deck m/c & 25%-27% in triple deck m/c. Finish speed : 160 ft/min in double deck m/c & 200 ft/min in triple deck m/c. Power : 30 to 40 H.P AC Induction Motor, 1500 RPM. a) BARE WIRE PAY-OFF :- Single ended type with leather belt brake arrangement to suit 750mm flange dia bobbin, traverse 280/300mm. b) MAIN MACHINE :- Body of the machine made of Cast Iron, thoroughly compact and leak proof, water cooling arrangement inside the drawing drum and the die box. Phosphorus Bronze worm wheel with high carbon axle steel worm will be provided for long life. The drawing drum is made from special graded cast iron hard metalized, machined and ground finished. The drawing die box is made of cast iron and steel die nut fittings. c) TAKE-UP/ SPOOLER UNIT WITH TRAVERSING :- It is driven with the help of 5 or 7.5 H.P Torque motor. It is suitable to take the load of 500Kg of Copper wires & 150Kg of Aluminium wire & the traversing arrangement will be WHOOMING type. d) Control Panel & Operating Desk. Step Cone Type Wire drawing machine is wet slip, stepped cone type suitable for drawing non-ferrous metals like Aluminium and Copper using a numbers of dies in tandem. The machines have horizontally mounted stepped capstans which is hardened and ground finished. The drive to individual capstan is provided through precisely manufactured Helical Gears. The gear train is housed in steel fabricated solid body and is oil immersed for smooth running. The die holders are adjustable and are provided between each capstan unit. Type : High Speed , Wet slip type. Material : Copper / Aluminium. Inlet : 3.25 Cu / 3.6 Al. Outlet : 1.8 - 0.54mm. Spooler : Single ended , Arbor type. Wire drawing machine is wet slip, stepped cone type suitable for drawing non-ferrous metals like Aluminium and Copper using a numbers of dies in tandem. The machines have horizontally mounted stepped capstans which is hardened and ground finished. The drive to individual capstan is provided through precisely manufactured Helical Gears. The gear train is housed in steel fabricated solid body and is oil immersed for smooth running. The die holders are adjustable and are provided between each capstan unit. Inlet Range : 0.9 to 0.7mm (20 to 22 swg) Copper. Finished range : 26 to 42 SWG. Copper. No. of dies : 21 Nos /15 Nos. Capstan : HCHCr, Hardened & Ground Finish. Drawing Speed Ist : Upto 1000mts/min. Motor recommended : 10 / 7.5 H.P AC motor. Drive Transmission : Through Timing Belts. Traverse : Electromechanical / Whooming Type. Traverse width : 250mm adjustable. Coolant pump : 0.15 H.P, 3 Phase. Wet Wire Drawing Machine is wet slip, stepped cone type suitable for drawing non-ferrous metals like Aluminium and Copper using a numbers of dies in tandem. 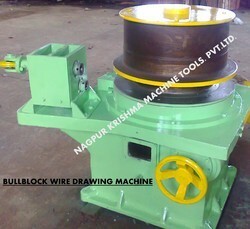 The machines have horizontally mounted stepped capstans which is hardened and ground finished. The drive to individual capstan is provided through precisely manufactured Helical Gears. The gear train is housed in steel fabricated solid body and is oil immersed for smooth running. The die holders are adjustable and are provided between each capstan unit. 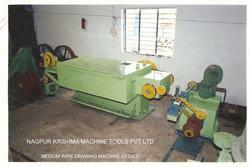 Looking for Wire Drawing Machines ?